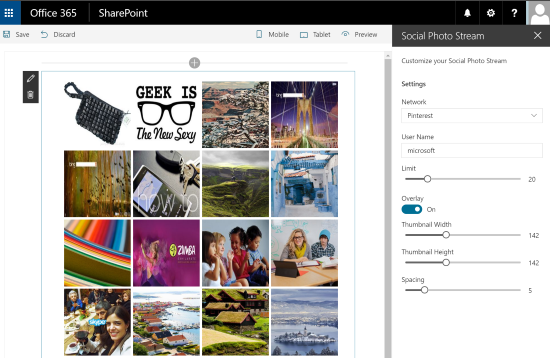 The Social Photo Stream Web Part is a SharePoint client side web part built with the SharePoint Framework (SPFx). This Web Part displays a list of photos from populars photos sharing plateforms as Instagram, Pinterest, Flickr, Deviantart, Dribbble, Picasa, Youtube & Newsfeed. You only need to specify a user accoung ID and choose the number of pictures to display. This web part uses jquery photo stream plugin.